Respect MP George Galloway says he has received an apology from the Egyptian president after being detained at Cairo airport for over 12 hours. Mr Galloway went to the Middle East on Friday after being invited to join an event against the war in Iraq. He said he was detained without food and water and only set free on Saturday after the event ended. On Sunday Mr Galloway said President Hosni Mubarak had "apologised on behalf of the Egyptian people". The Bethnal Green MP continued: "He said that I was a freedom fighter and friend of the Arabs. "It was a most gracious apology which I accept wholeheartedly. I consider the matter now closed." The MP was speaking after a visit on Sunday morning from Dr Mustafa el-Feki, an Egyptian member of parliament and chairman of the foreign relations committee, who passed on the president's message. 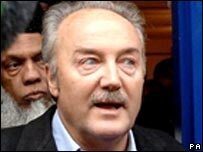 Previously, a spokesman for the Respect Party said Mr Galloway had been a critic of Mr Mubarak "and of other pro-western governments in the Middle East". Mr Galloway has visited Egypt many times as part of his anti-war campaigning, but was detained "on grounds of national security" on this occasion. He had travelled to Egypt this time to give evidence at a "mock trial" of Tony Blair and US President George Bush. Mr Galloway said he was kept overnight in a cell and had to sleep on a metal chair and was given no food or water. Recently he sparked controversy in the UK by becoming a contestant on Channel 4's reality show Big Brother.